This Friday, the world lost one of its brave souls, a warrior spirit, who in the face of a hopeless situation, made the absolute most out of every minute he had. At 17, Sam Berns was that warrior. If the name sounds familiar, you can probably thank HBO for that. Just last year, the cable network known for its Hard Knocks series produced and aired the documentary Life of Sam based on his life to that point and to bring awareness to his affliction. 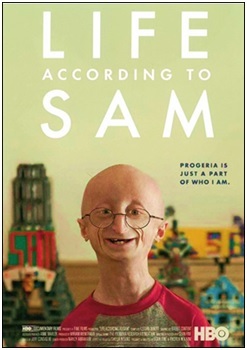 Sam Berns lived with a rare disease known commonly as progeria. Hutchinson-Gilford Progeria Syndrome is a genetic disorder that is so rare that it affects only an estimated 1 out of every 8 million born in the world. As such, not much is known about the condition which causes premature aging, fragile bones, kidney failure and a myriad of other issues. Thanks to the efforts of Sam, who outlived doctor's expectations by over 4 years and touched millions, that may change. The Boston Bruins heard about Sam's story and invited him to participate in several events benefiting The Progeria Research Foundation, founded by Sam's parents, who are both physicians. In November, young Sam dropped the ceremonial first puck at a game. Their efforts and the generosity of players, management of fans of that team deserve recognition. However, Sam and his family have earned our utmost respect and condolences. Having to face harsh realities in life is unavoidable. Turning those realities and transforming them into something that advances hope and awareness is another thing entirely. If Boston Strong exists as anything more than a catchy phrase, young Ben and his family are the true embodiment of what it should mean. For more information on Progeria and what you can do to help, visit http://www.progeriaresearch.org/ today.